Limestone funerary relief of Abuna, identified in the Palmyrene inscription over her left shoulder as the daughter of Nabuna, son of Anini. She wears a veil and headdress with a decorated band, featuring a central floral motif and a lattice pattern (see also PAL0112). With her left hand, she grasps the edge of the veil, a gesture frequently encountered on these reliefs. Her hair is up and back behind the veil (as in PAL0112, PAL0113). The woman wears a tunic and cloak fastened with a large circular brooch at her left shoulder, as well as earrings, a pendant necklace, and two rings on her left pinky. Her right arm is wrapped in her tunic and cloak, the edge of which she holds between her thumb and forefinger, with her middle-finger likewise extended, and her ring and pinky finger folded. Traces of red paint appear in the inscription over the figure's left shoulder. From Palmyra, dated c.170-230 CE. Abuna, daughter of Nabuna, son of Anini. Alas! Heyn, M.K. 2010. "Gesture and Identity in the Funerary Art of Palmyra," American Journal of Archaeology, 114 (4): 631-661. 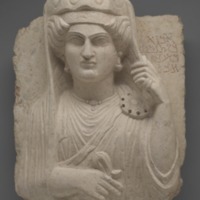 “Funerary relief of Abuna, daughter of Nabuna from Palmyra (PAL0111),” WIRE: Women in the Roman East Project, accessed April 24, 2019, http://www.wireproject.org/items/show/709.